On Friday, April 12, Governor Tim Walz signed a bill that bans a driver from using a cell phone except in hands-free mode. The law will be effective on August 1. The House and Senate authors, Rep. FrankHornstein (D-Minneapolis) and Sen. Scott Newman (R-Hutchinson), ushered the bills through their respective chambers since January and worked out language differences earlier in the week. 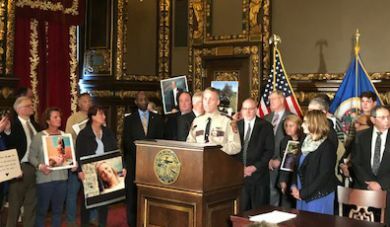 Families of victims killed by distracted driving, as well as state agencies and many industry groups, supported the bill as it went through several language changes. AGC is grateful for the work of the advocates over the last decade to get the bill signed into law. Addressing distracted driving is a top priority for AGC, particularly as cell phone use has an overwhelming negative effect in construction work zones. More information about the new law is available here.